Greetings, Gametoast. Well, here it is. A big thanks to all of my beta testers. I thought I was done with this map about three weeks ago, but boy, was I wrong! Below are a bunch of screenshots and the readme, which provides information regarding the game modes, credits, etc. This is a map very extremely loosely based on the Death Watch Bunker from Star Wars Galaxies. This map is only playable on the Galactic Civil war era. All sides/units are custom. - Play as Captain Archer, a non canon Imperial Storm Commando, as he carries out an operation for the Empire at the Death Watch bunker. - This campaign is an homage to the greatest Star Wars first-person shooters of the 1990s (mainly Shadows of the Empire and Dark Forces). Be on the lookout for a hidden, terrifying yet fun, Easter egg! 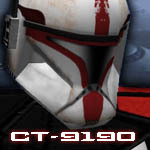 Extract the DWB folder from the archive into your Star Wars Battlefront II\GameData\addon folder. Delete it to uninstall. Map will show up as just "Death Watch Bunker" on the Instant Action list. If the campaign is not the first mode to be launched from the Instant Action list, then there will be an absence of music during its gameplay. - RevanSithLord, for writing a good portion of the campaign dialogue! Awesome, the finished 3.0 is out! I'm glad to have gotten to beta test this. Hopefully within the next few days I can show some game play of this on my channel. I'f you ever need me to beta test again, I will! This is an amazing map. I just have played Conquest and died during the campaign and must say this is one of the best campaign maps I have ever played in this game. This campaign is much more exciting than the original campaigns (althrough without these missions, custom campaigns wouldn't be possible). I love the new HD textures, the new sound effects and streams and I love that layout. @Sandtrooper956: Sounds great, and I'll be sure to request your services again in the future! @thelegend: Glad you enjoyed it! I do encourage you to play the campaign all the way through to victory if you get the chance, though. Looking good! On my to download list. I have all three versions of this map now, I got to say you really have done a fantastic job with this map AQT! The inside of the bunker is really filled with design and objects which is really good for taking cover and the turrets that shoot at the player really give this Death Watch Bunker a "stay out" type of message which is what I am looking for in maps! Now that this is done, what will your next project be? I loved the campaign, I actually felt like commander archer ! The voices, how droids spark up when you shoot them, the thermal detonator effect, the campaign scripting is all so amazing ! This is how maps should be made !!! MikeTheBeast55 wrote: Now that this is done, what will your next project be? I still have this Naboo map, Talay: Tak Base, Mustafar: Platforms, and Kashyyyk: Depot to finish up. The last one might go into a map pack/era mod of some sort. Maybe I'll write a guide or something. Very very nice looking. The graphic is awesome, but at the outside it looks a bit fuzzy for me. I'd prefer CW instead of Death Watch, but it's ok. Some weapons sounds a bit heavy, but most of them are heavy (Evok with turret 0.0). Just one question: How can I destroy the shield after I fight against all the evoks?? I searched everywhere but could find a way to open the shield. So I went back maybe I missed something, but all doors were looked except one, but I needed a key card for this. Well, there's your hint as to what you need to look for next. Are you sure you looked everywhere in that area? Lol, I found it instantly. But that's only because I played 2.0 :/ Tip: Parkour is fun. I'll have a look at this part Thanks for the hint. Is there a way to make the weapon reload faster?? It takes very long when firing with the blaster and then switch to the grenade attachment and back to the blaster. And I'd prefer a different HUD icon I never know what weapon is selected. Anakin wrote: Is there a way to make the weapon reload faster?? It takes very long when firing with the blaster and then switch to the grenade attachment and back to the blaster. 1. The reload time of each primary weapon is 2 seconds or less. 2. It takes less than a second to switch to the next primary weapon. 3. One primary weapon doesn't reload by itself while the other one is out/in use. I never know what weapon is selected. The weapon names are localized differently, and there's a big drastic difference between the two weapons' ammo counts the majority of the time. Yes I know there are different names, but they are only displayed for a short time after switching the weapon. The ammo is actually a good hint about what weapon is selected, but a different picture would be more visible. Maybe you can highlight the weapon part that is in use. So if you are using the attachment the main weapon is a bit transparent and if you are using the blaster weapon the attachment is a bit transparent. About the reload i'll have a look at it when i'm playing the next time, so I can give you a better description of the problem. It felt like the secondary weapon reload bug that causes a not firing primary weapon. But in this case with the 2nd primary weapon. I'll figure that out and tell you about it. Oh, what a nice surprise! Got Internet back after like 7 months, so this is a real treat. an other question the local scout troopers at conquest. Are they from BF3? RevanSithLord wrote: Oh, what a nice surprise! Got Internet back after like 7 months, so this is a real treat. Welcome back, RSL, and congratulations on your newborn daughter and starting a family! Gosh, it seemed just like yesterday when we were collaborating on mods and stuff. Hope you enjoy the map and good luck with everything. Thank you so much for the hint I got it now. Just one question where I need to get the color code. Is there somewhere an hint, too?? I simply tried every combination because I still had 8 lives left. If I understood the objective correctly I should loose one life per wrong try?? I lost no life, but I had 2 wrong combinations. How did you made the armour looking?? I love this "frozen" effect.